Certified Fundraising Yedi, you are. How did the Fundraising Force come over you? Force came over Yoda at young age. Yoda was born into long line of Master fundraisers, so strong was pressure to continue. Originally, Yoda wanted to be intergalactic veterinarian, helping creatures of all kinds. After some work with Save the Banthas fundraising campaign, Yoda knew his destiny. But passion to be fundraiser alone, not enough it is. Years of personal growth, meditation, dedication and learning, it takes to become strong fundraiser. Work is never done, and we must never stop bettering selves. Why does Fundraising need a #donorlove movement? Is fundraising broken? Although many claim fundraising is broken, agrees, Yoda does not. Needs work, yes. Consider retention rates of first-time donors being measured as low as 27% and dropping. Obviously, working great, it is not. This is why, a reminder we need, about importance of donors. We must never forget. Fundraisers have the power to make fundraising better by acting with Jedi skills of integrity, authenticity, and true interest in treating donors well. Donorlove is based on trust, respect and genuine appreciation for donor’s contribution to your mission. Actions you take should be simple, meaningful and personalized to the donor. If invest we do, in donorlove, Yoda believes trends will turn around, like asteroid being diverted by tractor beam. How can nonprofits strengthen their donorlove with social media? Powerful tool, social media is, and easy way of publicly showing appreciation and creating engagement. Donors have power to engage with nonprofits in ways they never could before. If your social media powers are weak, you will turn donors away. Some use social media to ask repeatedly for donations, provide boring updates, are not responsive to interactions, and are afraid to have personality. If your social media powers are strong, donors win. They can talk to you. They can hear from you. Share ideas. Learn about you in new way. Feel like they are connected. You can appreciate them, answer questions, have fun, create community. This is path to enhancing donorlove. Should donorlove be measured? Is it a donorlove-meter we need? Yoda believes in measuring what matters. Limited time, we have, so must make sure we are spending it on what is effective. Showing donorlove is not negotiable. It must be done. But, spend your time, where should you, hrrm? Measure impact of activities and ask your donors how they feel about what you do. Then adjust, enhance and keep getting better. While measuring, important it is, Yoda also believes we can sometimes get carried away. If we get overwhelmed or over-analytical, then miss, we may, chance to act. Without taking action, there is no change. Sometimes, we must act without all information, knowing it is right for the donor, and have faith in that. So to those who do not believe we should show donorlove until we can measure it, Yoda must ask – measure, can you, the impact of a hug? Which charity raised money on Social Media very successful? Five years ago, easier, this question would have been to answer. Now, many are doing great fundraising campaigns integrated with social media. Yoda believes successful campaigns are less focused on raising money, but more on raising awareness, then giving people opportunity to give. This list is most impressive. Which Yedi-skills can fundraisers learn to improve? Gratitude. This skill can never be sharp enough. This means not only thanking, but showing donor what their donation is doing, because that is how grateful we are and what we owe to donors. Encourages everyone, Yoda does, to jump on board the SS DonorLove. SS is for Steward Ship. Personalized, segmented communications. Stop, you must, sending all donors the same message. A board member should be communicated to as one. R2-D2’s thank you letter, in hologram format, it should be. Patience. Don’t rush donors for your needs, but don’t waste their time. The right amount of patience will help Jedi fundraisers to succeed. Rushing or not taking action when it is time, both will limit success. To become a Jedi fundraising Master, patient, you must be, but not overly so. Rush or take too long to act, and success will elude you. Thankful for your insights, we are. Thankful, Yoda is, for this opportunity to share, and honored by your invitation. Yoda also commends you, friend, and your team, for great work that you do on sozialmarketing.de to help fundraising sector. 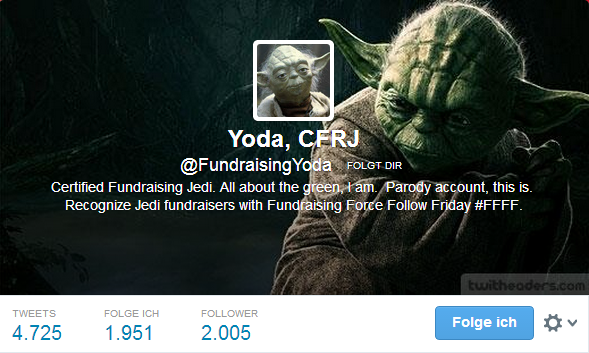 Yoda liebt fundraising auch.